« For sale near you…. Easter time in Britain can feel a little like an anti climax for me sometimes. There are pictures of eggs, bunnies and little flowers everywhere. And lots and lots of chocolate. I have to say I’m always partial to a bit of chocolate, and will very gladly eat that on any occasion. But in Greece, where I grew up, Easter is a bit of a different experience. The whole weekend is filled with moments of reenactment of the Easter story. 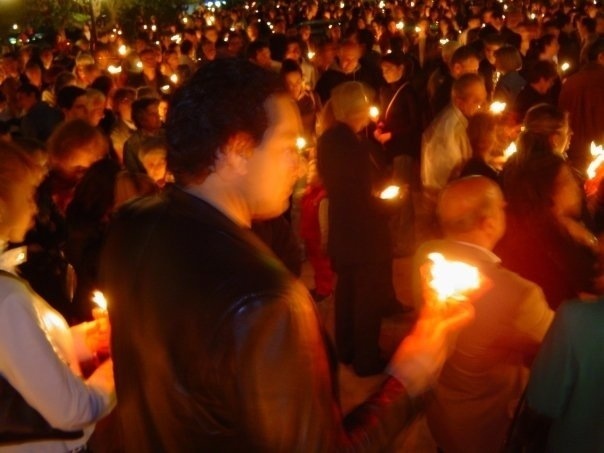 On good Friday, there are thousands of processions starting from churches and going around the streets. People follow while singing hymns of mourning and carrying candles. Millions go. On Easter Saturday night there is a resurrection service. At midnight, the priest announces “Christos Anesti” (Christ is risen). He then lights a candle the flame of which gets passed along the congregation. The light quickly spreads. Fire crackers and fireworks are being released, while people sing “Christ is risen from the dead. He has triumphed over death!” Everyone goes to this service. Everyone and their dog. I have been to this resurrection service countless times in my life. As a little girl, I totally loved the excitement ( even though my hair caught fire once from a candle held by the person behind me). As a young woman, I enjoyed showing off the Christian parts of my Greek culture to my non – Greek boyfriend/ husband-to-be, who was fascinated by the whole thing. In any case, whether you believe it or not, whether you practice Christianity or not, you can have no doubt as to what Easter is really about, when you are in Greece at Easter time.